Ahead of his set for Sourdough at Bungalows and Bears this Friday, we chatted to Habibi Funk about the label, some crazy stories of tracking down artists, the implications of postcolonialism, and today’s UK club culture. To kick things off, could you describe the sound you’re seeking to push with the label? For the label, despite the fact that funk is in the name, it’s more than just ‘funk’ music. Basically, the type of sound we’re looking for is when musicians combine the musical traditions from their region with sounds that come from the outside, putting them together to create something unique. These outside influences might very well be soul/funk/jazz, but they might also be non-Western musical influences like Ethiopian or Congolese music – this kind of exchange in musical influences is what usually creates material that’s interesting for us. Was there one experience or record in particular that made you want to start up the label? Or was it a gradually building interest? 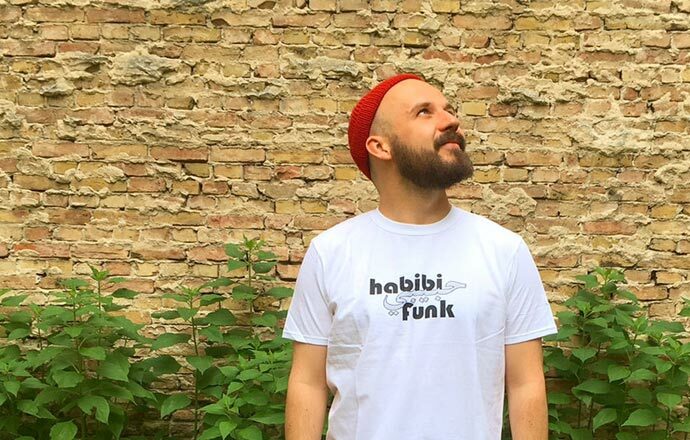 Could you tell us where the name Habibi Funk comes from? It was pure coincidence. When I started putting together mixes online, I was giving them more descriptive titles, then someone commented ‘Habibi Funk’ underneath one of the tracks in a mix, and we all kind of liked it and started using as a term here and there. Some Western reissue labels/blogs have come under fire recently for exploitative practise and exoticising the artists and cultures they are involved with. How do you approach the ethical considerations of reissuing Arabic music as a Western label in a post-colonial society? I mean, in the end, I guess if you are European and you’re dealing with artists from the non-Western world and countries where there’s colonial history, there’s automatically a certain responsibility to be aware of economic and cultural exchange patterns and try your best to not repeat them. We want to make sure that our deals are done in a way that I could happily disclose them publicly and there is nothing in there to feel bad about; all our music is licensed from the artists or their families with profits split 50/50. But it also goes a bit further than that when it comes to communication. Like, we would never do a cover for a release with camels or belly dancers on it, because we think it’s important to not repeat this stereotypical, orientalist perspective of the Arab world which has been a very predominant narrative in Europe for most of this century and even before that. It’s important to have a general awareness and be open to any sort of critique. Even once you’re open to this criticism you may have to decide to just see certain things differently, but yeah I think a general openness is important. I think we have good controls in place, because for whatever reason, we manage to have a rather big following in the Arab world, which I guess is kind of unique for a reissue label. Quite often their releases arepredominantly consumed by a Western audience, and I don’t know why exactly that is, but for whatever reason we manage to be very much heard in the Arab world as well as the West. Of course, I’m sure we occasionally do things that could be handled better, but we are trying to make sure that we are as aware as possible of potential issues. Have you got any particularly memorable experiences you’ve had when searching for records / artists? This classic story I’ve told numerous times, but it’s worth telling again because it strikes me as one of the craziest stories that’s ever happened to me. We had just found out about Ahmed Malek, the Algerian composer who we did 2 reissues of (there’s a third one coming, and there’s going to be a documentary about him as well). We knew we really liked his music but had no idea how to find his family as he had died 15 years or so before. I had a DJ gig in Beirut and a friend of mine came to the party. I told her about Ahmed Malek and she knew his music as well and said: “Oh, I have a friend in Algeria; I’ll ask her if she can help”. There’s like 40 million people in Algeria so I didn’t get my hopes up. I’d asked a lot of Algerians already who had never heard of him. But yeah, she called me two weeks later and it turns out the family of her friend was actually the neighbour of Ahmed Malek’s daughter. What a crazy coincidence. But yeah, I guess experiences of finding and getting together with artists or the families of deceased artists are usually among the most emotionally touching moments. Some of the artists had already made a comfortable living through music but a lot of them hadn’t so from the financial aspect these re-releases help some of these artists get the biggest pay check they’ve gotten in a long time. You put on an exhibition last year at the East Wing gallery in Dubai. Could you tell us a bit about this and how important it is to tell the stories of the people and context behind the music? It’s always important to contextualise what we’re doing, and the most obvious way to do that is by having an extensive booklet, with the contents varying depending on the release. For example, the Ahmed Malek release was largely soundtrack music, so we had someone write an introduction to Algerian cinema. But yeah, we realised there were other ways to contextualise the music and give people an idea of what the situation in the country was and the cultural context in which it was created, so we started thinking about how we could reflect this in different formats, like an exhibition. Then the East Wing gallery in Dubai approached us and we put together this exhibition. We are working on another exhibition this summer in Algeria, and then yeah, the documentary on Ahmed Malek I mentioned earlier – it’s kind of all following the same idea that outside of just presenting the music, we want to present the artists’ stories and give a deeper understanding of the surrounding context of the music. How have you found the reception from UK crowds? It’s always really good! You guys seem to drink a bit earlier in the night. It’s always fun to play in the UK because it starts kind of early and doesn’t finish too late – I’m usually tired by about 3am, so I’m not the type of person who has fun at a party from like 6-8am. I always have a lot of fun clubbing in the UK; it fits really well to my time schedule and people are always having a great time. If I play in London around half the crowd is usually Arabic, but if I play in Bristol most of the crowd might not be of Arabic descent, but even if I play the full on Arabic sounds it works in a way that it might not work playing to a fully German crowd. What’s in store for the Sheffield gig? Any plans for the kind of stuff you’re going to play or are you just going to freestyle it? Usually when I DJ its always 50/50 – half Arabic stuff and half other stuff I think will fit the vibe, but yeah I don’t really have any planned sets or whatever I just pack a load of records and see what feels right on the night! Habibi Funk plays Bungalows and Bears for Sourdough this Friday, free entry.